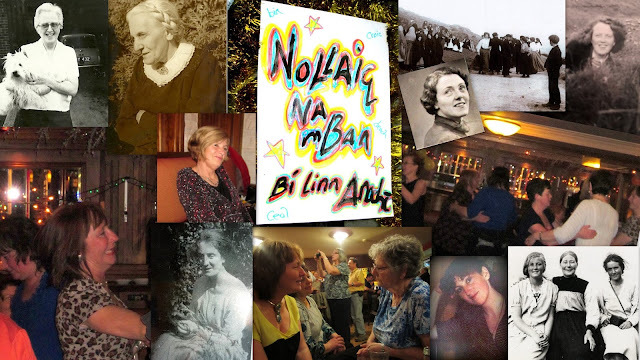 The Wran’s Day, which happens on 26 December, just after the winter solstice, is as much a part of the holiday season in Corca Dhuibhne as Christmas Day itself. Its name’s a corruption of the English word ‘wren’, and in Irish it’s Lá an Dreoilín. There’s endless research on the Wran’s Day, and suggestions that dreoilín, the word for wren, comes from draoi-éan, ‘druid’s bird’. It’s linked to ancient midwinter festivals and shamanism, when a shared web of ideas and information was accessed like a form of internet powered by human energy, and to later folk traditions like Straw Boys and Guisers. Its rituals belong to a dream state beyond stories, or even words, when there were just images and rhythms. But if you turn up in Dingle on 26 December, what you’ll see is one big party. Basically, the town gets taken over by musicians and dancers. In the past, the boys back west used to dress up in rags and old coats turned inside out. They’d smear soot on their faces, or wear masks, and go from house to house, playing music and asking for pennies ‘to bury the wran’. Then they’d use the money to buy food and drink and throw a dance. Earlier still, live wrens used to be hunted and killed and carried in procession. Earlier than that, at huge ritual gatherings, kings offered themselves to be killed at the turn of the year, in an extreme version of sacrificing the best you’ve got in times of scarcity. Through the nineteenth and twentieth centu­ries, the Church did its best to suppress the Wran’s Day. But it never succeeded; and its ancient, wordless rhythms are still felt here every year. Some kids still walk the roads in costumes here back west, and turn up at their neighbours’ houses to dance in the kitchen. Each separate group’s called a ‘wran’. You hear the creak of the gate and the rattle of a drum outside the window. Then tattered figures with masked and painted faces crowd into the house, disguised in their granny’s aprons, padded with rolled-up socks; or their dad’s pyjamas, tied with rope and stuffed into wellingtons. As they come into the room, accordion players pull their masks down over their faces and whistle players push them onto their foreheads; the smaller figures giggle and shuffle. Then someone gives a note and the little group breaks into a jig or a polka.